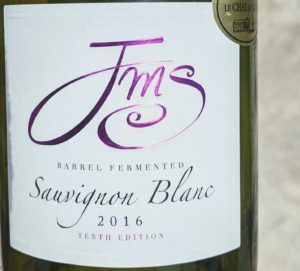 When I pick up a Sauvignon Blanc it’s normally because I want something bright, fresh and lively, a wine that’s lived a totally clean and sterile life heading straight from stainless steel to sterilised glass bottles to my glass. I live a fairly norm-core life but sometimes I like to live on the edge, do something a little crazy, walk on the wild side. When that happens I get my freak on and buy barrel fermented Sauvignon Blanc. I’m such a rebel. This Le Chai au Quai JMS Barrel Fermented Sauvignon Blanc ’16 from Laithwaite’s is just wild enough for me. Rather than growing in New Zealand and spending time in stainless steel it’s from Bordeaux and fermented in barrels, but not all in the same barrel, and not all in new oak. It’s a clean, clear, pale apple colour and it smells of tropical fruits with a little lemon. There’s a hint of something more complicated but at first sniff it’s all fruit. It’s dry, with a firm acidity. It tatses like it’s undergone malo-lactic fermentation, with the fruit acids turning into the same ones you find in milk, or perhaps more appropriately, cream. Creaminess is a good descriptor, no-one is going to buy a wine that tastes like milk. That creaminess comes with just a hint of oak. It’s not the full on toffee apple you’d get with a Chardonnay treated in the same way, but maybe more like pineapple with a little caramel sauce. I may not be doing it justice with that description, I fear I make it sound like a great yogurt flavour. Think pineapple cube sweets with a hint of salted caramel and a slug of fresh lemonade. I wouldn’t trade in regular fresh and zippy Sauvignon Blanc for this wine every time, but for something that pitches somewhere between cats’ pee on a gooseberry bush and toffee apples rolled in coconut, this offering from Laithwaite’s own production outfit is worth a try. At £9 a bottle it’s reasonable value to mix things up a bit.